While most of us enjoyed yesterday's Dark Night trailer—though we found typing on lopsided laptops for the remainder of the day a bit inconvenient—watching Batman on the silver screen has and will always be a vicarious experience. It's a humbling reminder that we weren't separated from our parents by tragedy and that we don't live in cities completely overrun by psychotic criminals who lust for torture more than money. But at least we can score the real Batmobile. 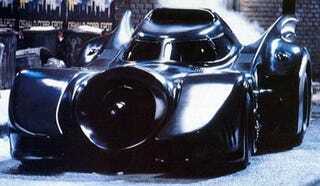 From Tim Burton's original Batman, an eBay seller is offering up one of the five existing Batmobiles. It's 20 feet long and 8 feet wide, sitting on a custom-built chassis and powered by a Chevrolet 350 engine.